Jetrea is an enzyme that is injected in the vitreous in patients with vitreomacular traction. The vitreous is the gel that fills the eye. The macula is the central part of the retina that you see straight ahead with. As we age, the vitreous typically relaxes away from the macula, contracts, and pulls forward in the eye. This usually occurs between age 50 and age 70 years. In some people, the vitreous does not relax away from the macula before it contracts. In those cases, the macula is pulled away from the back of the eye by the contracting vitreous causing disturbances in the central vision. Some people see distortion and some see vision loss and some see both. Some patients have so much traction that they develop a macular hole. 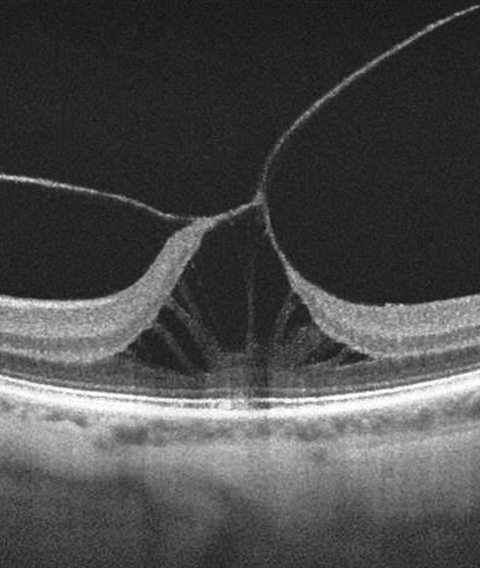 The image shows and optical coherence tomography scan of a patient with vitreomacular traction. Jetrea is an enzyme that breaks down proteins in the eye responsible for vitreomacular traction. 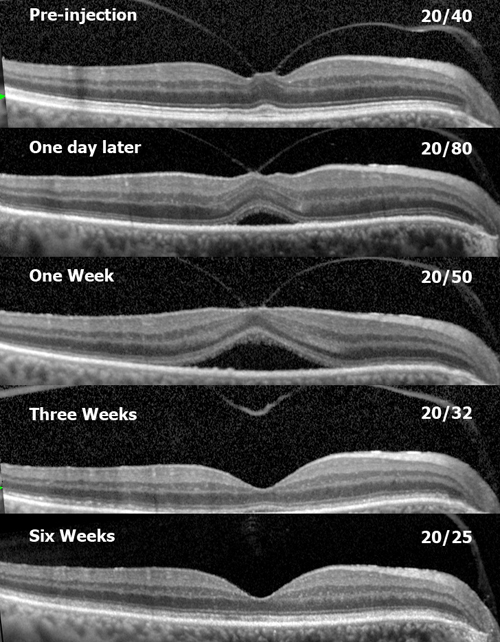 The breakdown of these proteins allows a better separation between the vitreous and macula and can reduce the chances that tugging will occur. The alternative treatment for this condition is a surgical procedure called a vitrectomy. The safety and effectiveness of Jetrea were established in two clinical studies involving 652 patients with symptomatic VMA. Patients were randomly assigned to receive a single injection of Jetrea into the eye or a substance without the active ingredient. Patients were evaluated over the next 28 days and for any side effects over the next six months. The studies found that VMA resolved in 26 percent of patients treated with Jetrea compared with 10 percent of those treated with the inactive product. The most common side effects reported in patients treated with Jetrea include eye floaters; bleeding of the conjunctiva, the tissue that lines the inside of the eyelids and covers the white part of the eye; eye pain; flashes of light (photopsia); blurred vision; unclear vision; vision loss; retinal edema (swelling); and macular edema.